When Apple released the first 12.9-inch iPad Pro, I wondered if it was finally an iPad that photographers could embrace without also getting an armful of tradeoffs. The answer was: almost (see “How the iPad Pro stacks up as a photographer’s tool”). Although that initial model and the subsequent 9.7-inch iPad Pro improved upon earlier iPad generations in significant ways, several items still came up short. Now, the iPad Pro has finally reached a tipping point for photographers. The improved hardware in the just-released iPad Pro models, plus software improvements in iOS 10 and the upcoming iOS 11, make the iPad Pro (mostly) fullfill the potential of the iPad as a true photographer’s companion. In general, earlier iPad models were powerful enough for most things, but that didn’t translate necessarily to photography tasks. Apple skimped on internal memory—as little as 256MB—which affected performance when dealing with large image files. The 2017 iPad Pro models each include 4GB of RAM, which gives them plenty of working space. Storage is also much better. Gone are the days of trying to shoehorn images onto a 16GB device. iPad Pro capacities start at 64GB, move into a more comfortable 256GB, and top out at a comparatively roomy 512GB. At last, iPad storage is on par with laptop SSDs, which is important when you can realistically fill multiple 32GB memory cards with images during vacations or long photo shoots. Moving those files is also much improved. Both iPad Pro models now support fast USB 3 transfer speeds through the Lightning port. The ability to import photos using an adapter is, I’d argue, what sparked the notion that the iPad could be a photographer’s tool in the first place. Although the previous 12.9-inch model was the first to add USB 3 speeds, last year’s 9.7-inch iPad Pro offered only USB 2 speeds, which was painful whenever I wanted to import images directly from an SD card to the iPad. Both iPad Pro sizes now support the wider P3 color gamut, which not only keeps images consistent with other Apple devices that also support P3, but also offers near perfect color accuracy. Of course, photographers will also enjoy the improved displays. The 10.5-inch screen affords more room to view and edit images, and yet the dimensions are only slightly taller and wider than the 9.7-inch model. Both iPad Pro sizes now support the wider P3 color gamut, which not only keeps images consistent with other Apple devices that also support P3, but also offers near perfect color accuracy. And what about the iPad Pro as a camera itself? The new models share the same camera hardware as the iPhone 7, making them good cameras on their own if you find yourself composing shots or recording video. One of the biggest snags for many photographers was the iPad’s inability to deal with RAW-formatted files. You could import them, but iOS used the lower-resolution JPEG previews created by the camera (or saved in parallel if you shot in RAW+JPEG mode) for displaying and editing. RAW files contain more image information than JPEG files, offering greater latitude for edits such as bringing detail out of dark shadow areas. iOS 10 added system-level compatibility for RAW files, and many developers have taken advantage of that to build RAW support into their apps without having to code it all from scratch. The A10X processor in the iPad Pro also provides more power for crunching those numbers and displaying edits faster. 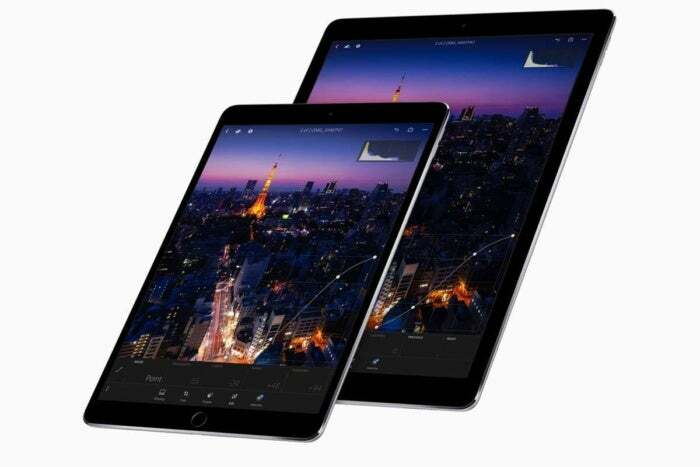 Improved processors and more memory and storage opens the door for developers to create better image editing software, which has come a long way since the iPad Pro first debuted. Affinity Photo for iPad is the latest effort to be a legitimate Adobe Photoshop replacement for iOS, with professional layers, masks, and compositing features. 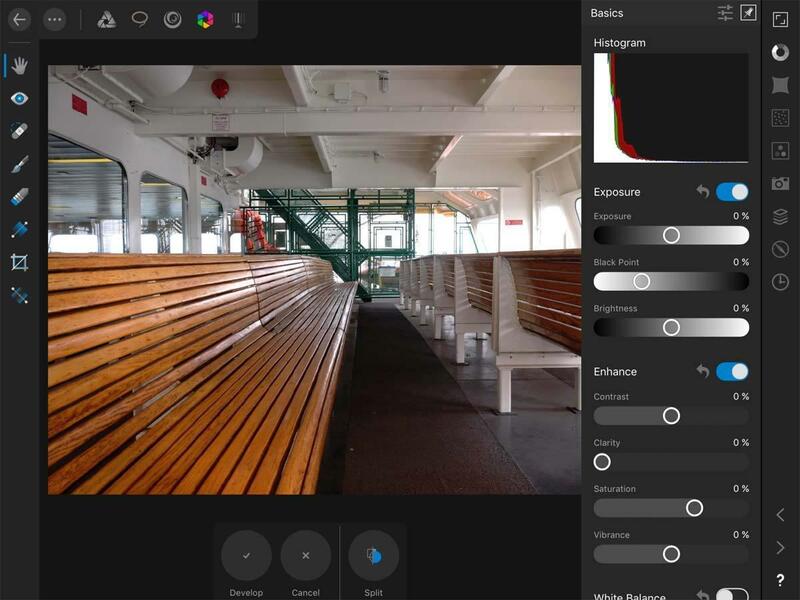 Adobe’s own Lightroom for mobile app has also improved by leaps and bounds to incorporate features such as selective masks and the Dehaze control found in the desktop version of Lightroom. For photographers who manage their libraries in Lightroom, the ability to sync albums via Creative Cloud make it easy to review and edit images on the tablet or the desktop interchangeably. All of this isn’t to say that the iPad Pro can completely supplant a Mac for most photographers. One of my ongoing irritations is moving photos from the iPad Pro and back to my Mac, where my full photo library lives. 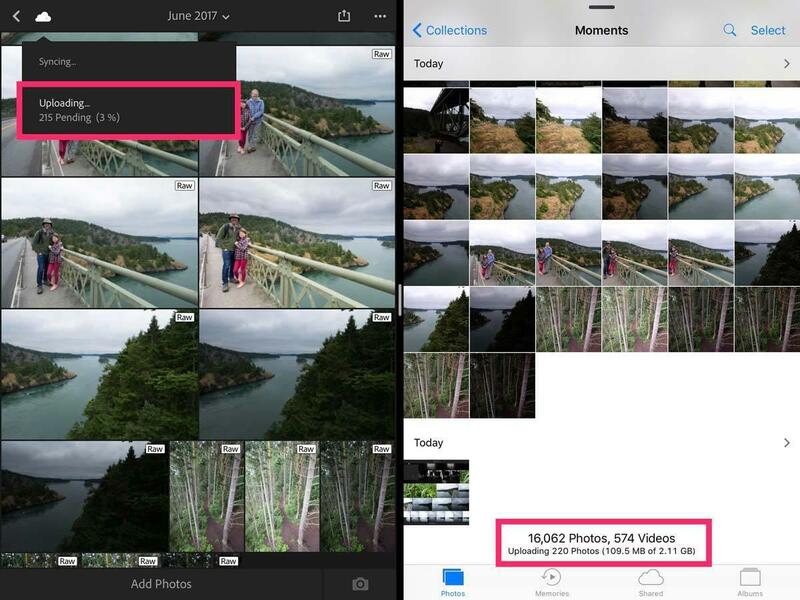 Creative Cloud and iCloud Photo Library both work well for this in a limited way, but they’re dependent on transferring that data out to far-flung Internet servers. Let’s say I spend a weekend away and shoot 16 GB of photos, and because the iPad Pro is small and light and powerful, I left my MacBook Pro at home. I spend time favoriting images and doing some light editing in Lightroom mobile (or Apple’s Photos app), and then want to sync those back to the Mac. I need to wait for that 16 GB of data to first be transferred to the cloud, and then beamed back down to my Mac. Even if I shot just 2 GB, it’s still a small hassle on my home broadband, and basically impossible if I’m at a hotel or coffee shop. Uploading images that were first imported from my camera’s memory card into Photos (right) and then added to Lightroom mobile (left) is a laborious way to get them into Photos and Lightroom on my Mac.